Asking price only $349,800 or best offer! Looking for the beach and a great income….THIS IS FOR YOU!! 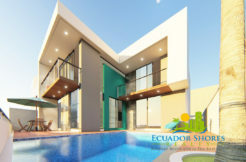 This beautiful new construction beach home is perfect for relaxing and living the good life, while still making a great paycheck! This home is comprised of two separate 3/3.5 homes on each level, which means that which ever one you choose to live in, the other home is perfect for extra rental income! With a lot size of over 14,000sqft, you also have plenty of room left over for additional construction such as pool, boardwalk, or even an extra couple bungalows to increase your earning potential! 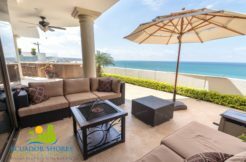 Both homes have wide open main living areas with unobstructed views of the great Pacific!The kitchens blend into the dining and living area and the great room is wrapped in large windows so you always have an incredible vista!! Located on the South end of Santa Marianita beach, this area is known for it’s peace and quiet, and beautiful open stretch of beach. 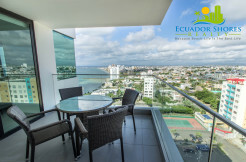 You area also just 15min South of the large coastal city of Manta where you will find all of your city amenities like shopping, grocery, hospitals, entertainment, fine dining and more! Contact us right away for all of the additional info on this fantastic opportunity, and to schedule your private tour!